Betty Jarmusch, beloved mother, grandmother and lifelong writer, died peacefully at home in Shaker Heights on November 15. She was 96 and the widow of Robert T. Jarmusch, her husband of 57 years. 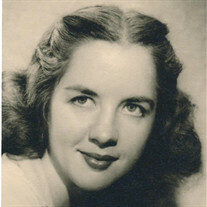 She was born Ruth Elizabeth French, in Andover, Ohio on January 3, 1921, and had lived in Silver Lake until the 1970s. Before meeting her future husband in an Akron candy store, Betty French blazed a trail in American journalism when she became the Akron Beacon Journal's first woman movie and theater editor during the 1940s. Her beautiful, accomplished writing includes an incandescent review of the young newcomers Marlon Brando and Jessica Tandy in "A Streetcar Named Desire" on Broadway (she took the train from Akron). She also covered the wedding of Humphrey Bogart and Lauren Bacall at Malabar Farm in 1945, and reviewed a Duke Ellington concert, "heightened by the superb Ellington music," that same year. She interviewed movie stars and performers, including Bogart (her photo with him ran on the Beacon Journal's front page), Ginger Rogers, Wallace Beery, and Boris Karloff, and she reportedly once shared an elevator with Roger Rogers' palomino, Trigger. Her encyclopedic knowledge of movies, directors and actors made for engaging conversation and insights all her life. A prolific and versatile writer throughout marriage and motherhood, Betty published features, essays and short fiction in magazines such as Status, Good Housekeeping, Antiques World, Bride's, Marriage, Girl Talk and Woman's World. Her 1974 New York Times op-ed that challenged the government for blaming citizens for a national economic crisis was read in the White House, according to a 2013 biography of financial adviser Sylvia Porter. A University of Akron alumna, she later wrote an unproduced dramatic screenplay set in Akron involving World War II-era spies and their Zeppelin. Betty encouraged her three loving children, Ann Elizabeth Jarmusch, of Sedona, Ariz.; Jim Jarmusch and Tom Jarmusch, both of New York City; and her close friend and caregiver, Raquel Robinson, to pursue their own creative lives and independence in their chosen fields. Betty was as strong of character as she was sweet, generous and witty. In addition to film, she maintained strong interests in art, antiques, nature, literature, progressive politics and civil rights. She researched the history of the Jarmusch family's prior home, an 1830s Western Reserve-style house in Silver Lake, where she also tended the old garden and brought lilacs and peonies indoors for everyone's enjoyment. An avid library patron and reader, she was also an enthusiastic docent at the Akron Art Museum and tutored students in that city. In addition to her husband, Bob, former president of Interior Steel Equipment Company in Cleveland, she was predeceased by her beloved twin brother, Robert James French, and remarkable mother, Caroline Elizabeth French. Her sister-in law, Geann French of Wadsworth, survives her. The family wishes to thank Betty's extraordinary, compassionate caregivers. In addition to Raquel Robinson, they include Andreda Bland, Shay Gamble, Shantel Jones and Mayra Pavon. Arrangements were by Brown-Forward. Because Betty was a lifelong animal lover, with cats as her favorite, we ask that in lieu of flowers please consider contributing in her name to the Cleveland Animal Protective League, 1729 Wiley Ave., Cleveland, OH 44113.